First, they needed to conserve both the floor space and oven size as much as possible. Secondly, they needed to have a quality control system that would allow them to identify and address paint and assembly issues without disrupting the curing process. This company used a Pacline Power and Free Overhead Conveyor as a solution. The system was designed with two separate conveyor tracks. 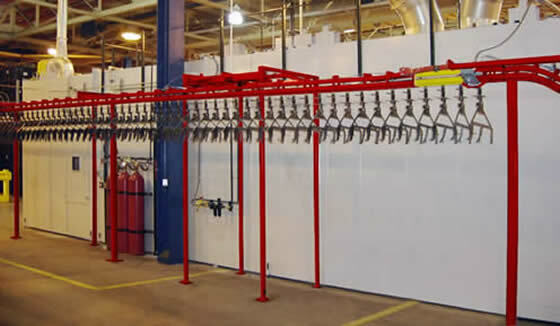 One track carried parts for paint processing on 24″ spacing. After processing, these parts moved onto a separate track where they were then rotated for “close pack” accumulation on 7″ spacing in the curing ovens. 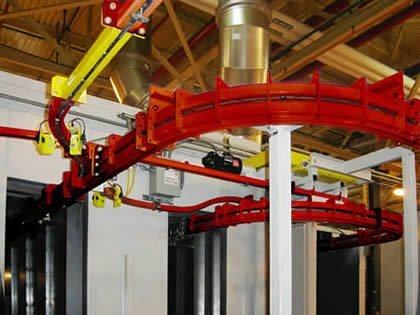 On the process line track a Quality Assurance system was integrated that allowed the parts manufacturer to view paint and assembly quality without disturbing the separate curing line track. Overall, the system length was reduced by two thirds on the curing line allowing for reduced floor space and more importantly, a 60% smaller oven. Pacline Power and Free Conveyor trolleys are over 20% smaller than most, which helped to further reduce accumulation space in the oven. In addition, the PACLINE trolley configuration allowed for accumulation around a tight 180 degree curve in the oven, without any bumping. An additional challenge with this system was establishing drive speed and pusher dog synchronization between the separate process and cure chains. However, PACLINE’s conveyor software addressed these issues with seamless integration resulting in a complete system that runs smoothly and efficiently. Learn more about our Power and Free overhead conveyor systems from our Pacline Blog.